February | 2010 | How Can I Keep From Singing? The grief thing has been rearing its ugly side. It seems like there are also little things cropping up. I try to at least recognize what it is. When I feel like not leaving the house and not seeing anyone I try to evaluate if my reasons are valid. If I cannot come up with a good reason and it is just an overall feeling of not wanting to then I know it is the grief. The week before last I felt that way about choir rehearsal and made myself go at the last minute. It was a good thing and it helped to pull me out just a bit. Other hard stuff arises. 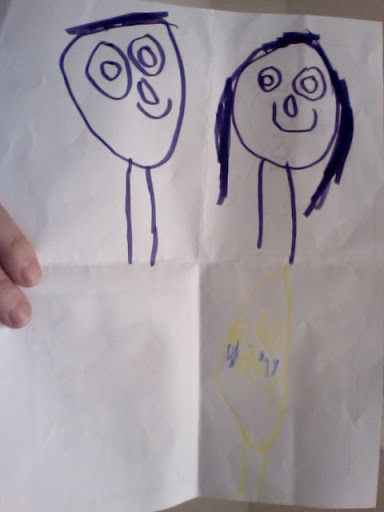 Lauren drew a picture of Nathan and Julia for Julia. She drew some hair but then questioned if she did it ok since she said she didn’t know what he looked like with hair. I guess in most of the pictures we have out he is either bald or wearing a hat. This morning she came to me with the picture and asked me if I thought Julia would like it. She showed me that she added a picture to it of Julia crying because now in the picture of Nathan he is dead. I told her that I didn’t think she would like it because who would want a picture of oneself crying. I don’t know what she really wanted to ask me. I had to run downstairs and when I came back up she was lying in my bed with it very sad. I just told her that Nathan loved her very much and, in fact, loved her just as much as he loved Julia and that he did know her (Lauren) and that she had just as much right to be sad as Julia does. I have no idea if this was the issue. I have no idea – but that is what I said. Today she has a friend over. Her friend likes to constantly talk about how Lauren’s brother is dead. She has a big brother the same age so I know it really hits home to her when she is with Lauren that Lauren’s big brother is not here. I understand her need to talk about it. It is just a bit jarring at times. Posted on February 9, 2010 | Enter your password to view comments. Remember this post about playing the glockenspiel in front of church? 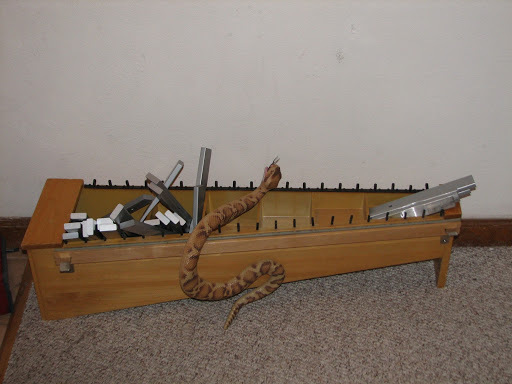 I love that the snake is involved – denoting the evil nature of the instrument. Actually the glockenspiel and the snake are both waiting to go to the basement but I have not brought them down yet and am enjoying the strangeness. The kindergarten choir director has sent the instrument home with Luke. It needs a little fixing and she wants him to do it. So – we have it and the question is, how quickly do we fix it? We perform in a few weeks. I am thinking it will take just a bit longer than that to repair….